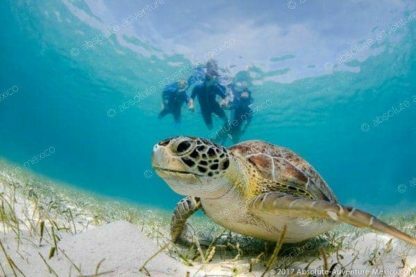 PRIVATE TOUR: For snorkeling lovers: Swim in a cenote and with sea turtles at Akumal bay. This private tour includes a delicious meal a la carte at a local Mexican restaurant. We advise 08:00am from your hotel. We advise 08:15am from your hotel. We advise 08:30 from your hotel. We advise 08:45am from your hotel. We advise 08:30am from your hotel. 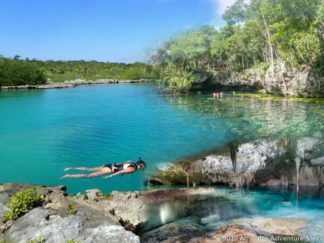 The ideal snorkeling tour gathering swimming in the ocean and in a cenote! 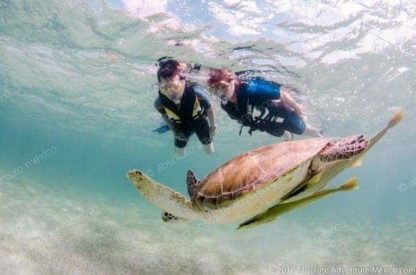 This private snorkeling tour offers an amazing experience that is perfect for families, kids and group of friends. 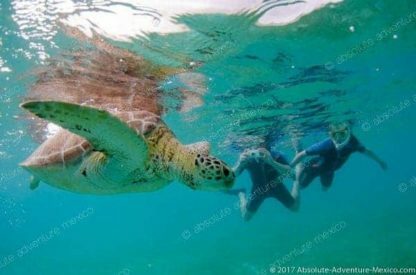 With this private tour, you will receive the opportunity to snorkel right alongside the gentle giant of the ocean, the green sea turtle. 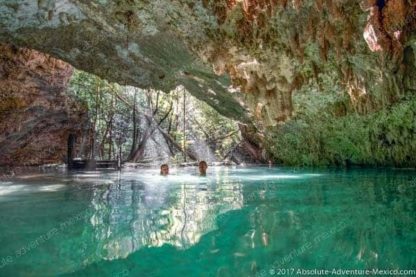 After a dip in the ocean, our guides will transport you to the cenote you have chosen for a different snorkeling experience. 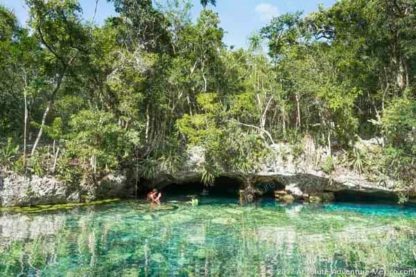 You have the luxury of picking any cenote on our list. We have a variety of spots that embody a cave experience or that of a natural, open cenote. 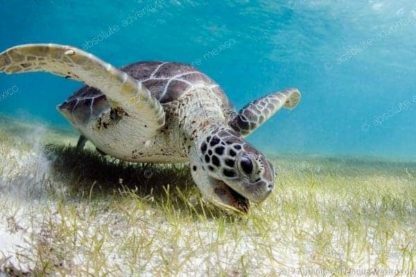 While snorkeling alongside a sea turtle may seem extreme, they are some of the gentlest creatures in the ocean. They are truly majestic creatures that guide through the water with ease. 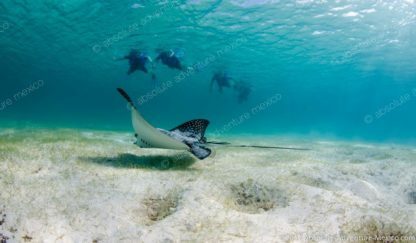 Also, if you get lucky, you will be able to see a few stingrays swimming just above the ocean floor. Again, don’t worry, these animals are harmless. 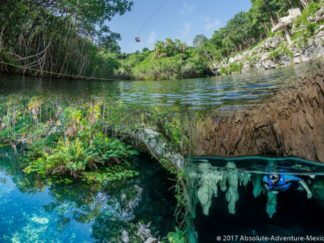 Moving from the ocean to a smaller body of water in the jungle, the cenote. No matter what cenote you choose, you are sure to experience a fun-filled day. Every cenote is unique. As you snorkel through the water, you will see beautiful formations and landscapes you have likely never before seen. This tour is completely adaptable for snorkelers of all ages and skill level. Our guides will play to your strengths and are happy to provide snorkeling tips. Any and all equipment you need will be provided by your guides. We will end the tour with a great lunch at a local Mexican restaurant before bringing you back to your hotel. 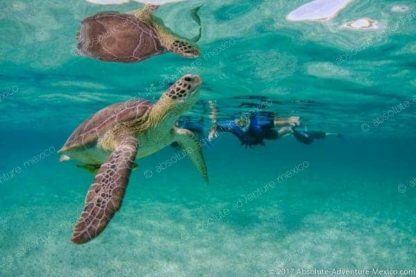 We hope that you will join us on our swim with turtle tour partnered with snorkeling in a cenote. We know you will have a memorable experience! 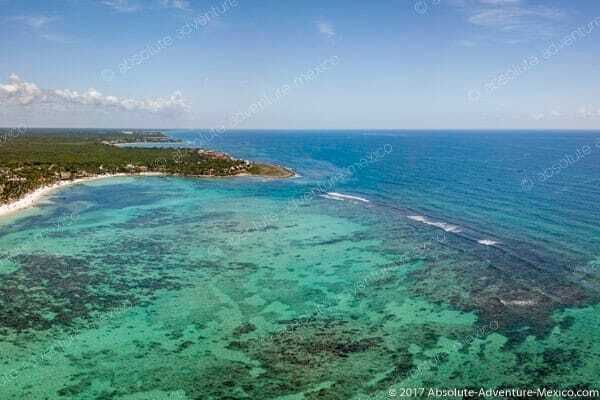 We used Absolute Adventure for a private snorkeling trip. Our family had never snorkeled, but Absolute Adventure took great care of us. The best part is that it was private. It was just us, not a big tourist group. We were picked up at our resort. Not only were they on time, but early. The turtles and fish were amazing. We highly recommend Absolute Adventure. 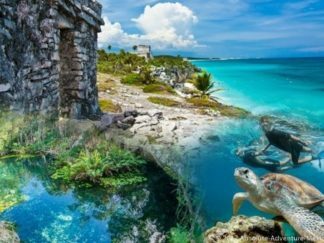 My friend and I booked this tour on a girls weekend in Tulum and we had the best time! We were the only ones on the bus and Arturo spent so much time sharing the history of the area and answering all of our questions about Tulum and the surrounding areas. I would highly recommend booking a tour with Absolute Adventure. We had a four person private tour and it was just what we were looking for. 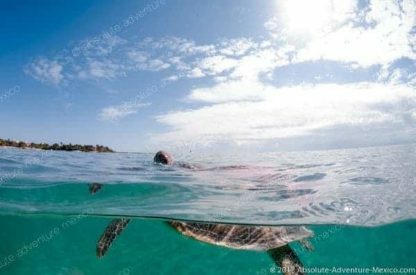 We went early in the morning to Akumal to snorkel with the sea turtles. 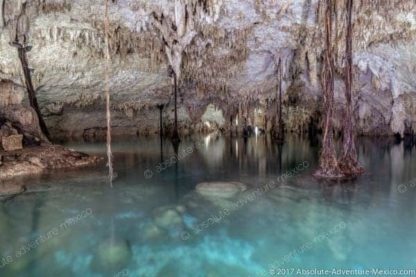 Then we had an amazing time in a cenote snorkeling around. It was quiet and informative. Thank you very much for the wonderful time and I would definitely recommend this company! Both Akumal and Nic Te Ha cenote are fabulous snorkeling places. 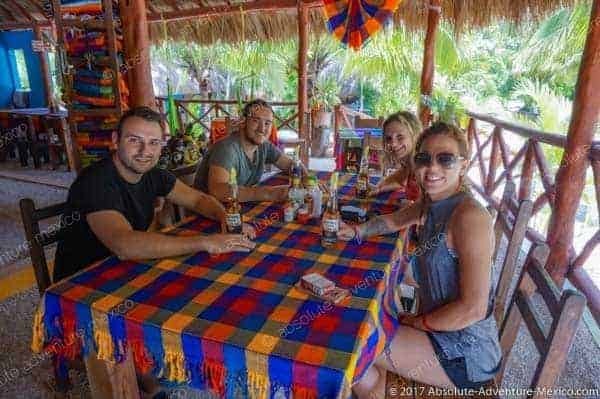 They provided Everything was included from transportation to and from Cancun, private guide, snorkeling equipment, drinks and lunch. Was had a blast, it was a perfect day! We went snorkeling in a cenote and then snorkeling in the ocean with turtles. It was a great combination and a very satisfying day. The whole time, Chris and Marianna were wonderful guides, explaining everything along the way and making sure all our needs were met. They were also great with the kids. Excellent guide; good English and very friendly. 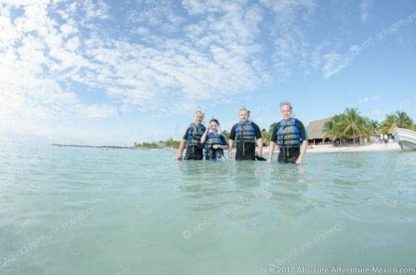 It was nice to avoid the very large group excursions that are sold out of the resorts and get a personalized one of a kind Experience. The tour was absolutely wonderful! We had such a great time. I really appreciated that they encouraged going earlier since we were staying in Tulum. It was like we had the ruins all to ourselves! 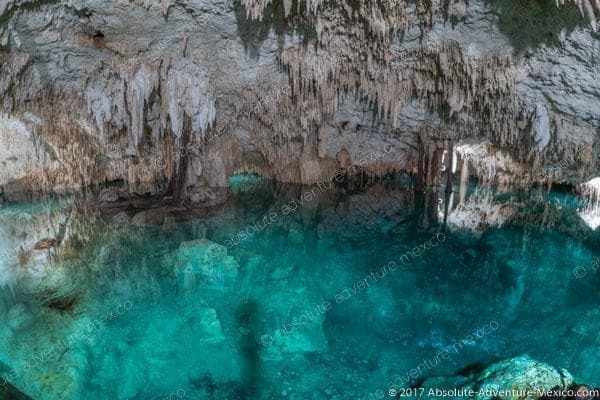 The cenote was also a great experience and I felt safe to leave my stuff in the car during the swim. Arturo took great photos of us and the sites that were emailed to us within one day! I would highly recommend it to others! Arturo made this day unforgettable. He was knowledgable and answereed each and every question of ours! I am very happy about this private tour experience, it’s a real plus. My brother and I had the most amazing time with Juan He was a perfect host that provided us with geological and historical facts. 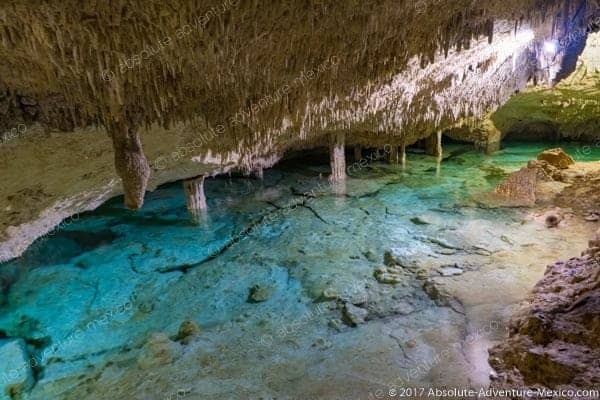 The cenote was beautiful and the lunch was absolutely delicious. Snorkeling with the turtles will forever be one of our favorite memories of our trip to Mexico. Thanks for the awesome experience! Well organized, safe, and fun! 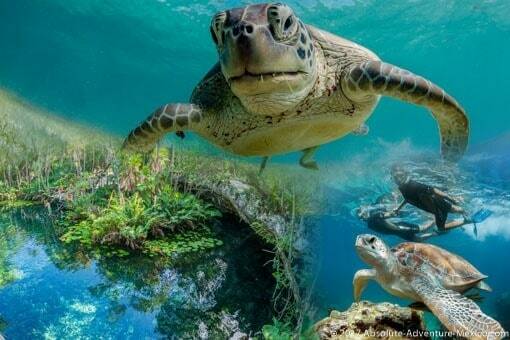 We did the snorkeling with sea turtles and a cenote adventure. I’d recommend this to anyone. This was the best day of our vacation. My boyfriend and I did the turtle and cenote swim trip. Our guide was knowledgeable and friendly (and spoke great English!). I’m so glad we booked a private tour and went first thing in the morning – we had both swimming locations all to ourselves, which is so nice in “touristy” locations. It was our favorite activity of the trip! The booking, transportation, and overall customer service experience were great. 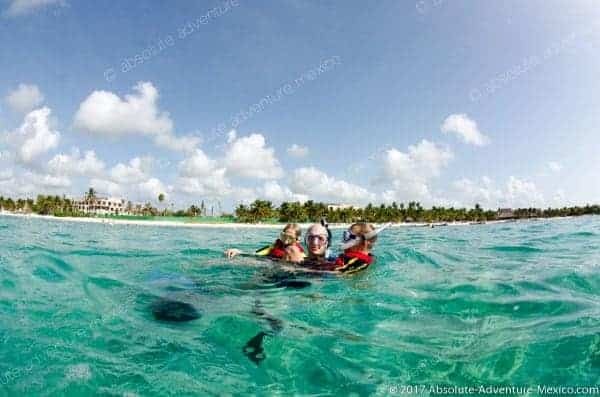 We snorkled in a bay with green turtles and Chris was wonderful, patient with our group of all levels of experience. Then on to the cenotes, which was definitely a highlight!! Crystal clear water, formations overhead and bats hunkered down or ting around!! It was awesome!! So fun and Chris added his humor, knowledge and even with some more tentative in our group he made everyone feel comfortable and safe. 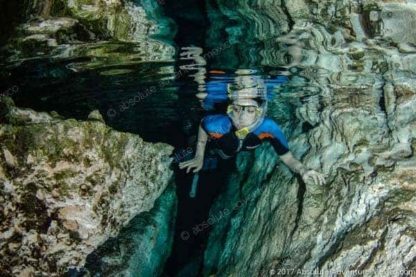 My family and I did the turtle and cenote snorkeling tour over the holidays and it was one of the highlights of our trip. Arturo was our guide and he was friendly, upbeat and knowledgeable. Misael was our driver and we felt safe with him behind the wheel. We would definitely take another tour with Absolute Adventure! Went swimming with the turtles at Akumal Beach followed by a swim in a Cenote. What a great day. Came within 5 feet of several turtles. Cenote and lunch was great also. I highly recommend Absolute Adventures. 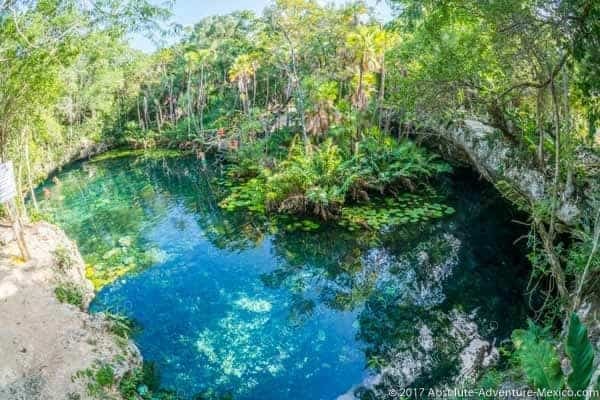 My family and I did the turtle and cenote snorkeling tour over the holidays and it was one of the highlights of our trip. Arturo was our guide and he was friendly, upbeat and knowledgeable. We would definitely take another tour with Absolute Adventure! Top notch service – the tour took us to Akumal to swim with Sea Turtles and our choice of cenotes for a swimming experience. Claire was a very a warm, friendly and informative guide and provided only quality gear and wetsuits. Highly recommend Absolute Adventure and the entire Tulum area.